We visited the Callaway Gardens in Pine Mountain, Georgia. I am teaching my daughter the alphabet and had just finished up the letter "V" and were starting "W". 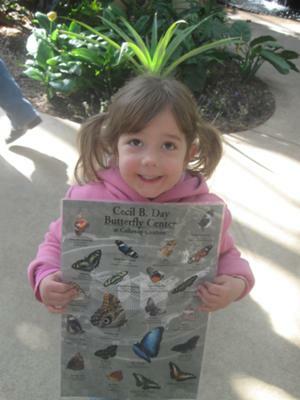 We toured the "Victory" Garden and later we toured the Butterfly House. We discussed the butterflies "wings" and how they fly. We also covered why it was so hot in the house and what a chrysalis was. We finished up at the Discovery Center where they had an artist's photography on display. The artist had photographed the entire alphabet in nature. It was beautiful and my 3 year old loved it! I'm just wondering what you guys do with the chart of butterflies...are you supposed to check the image of the butterfly if you saw it inside the butterfly garden...is that the idea?